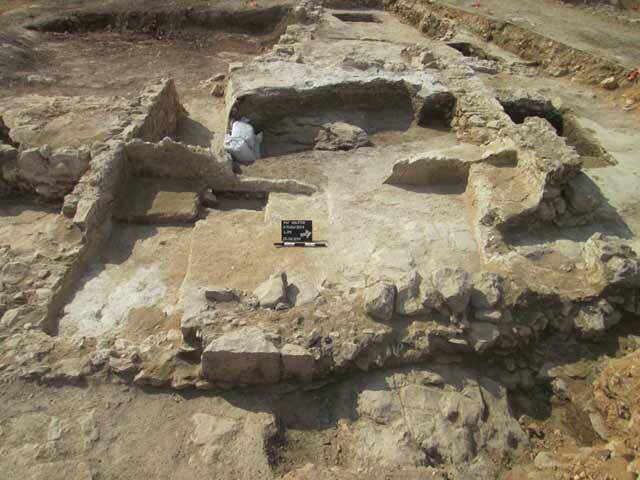 In February 2014, a salvage excavation was conducted at the site of Mazor within El‘ad (Permit No. A-7046; map ref. 195418–508/661829–917), prior to construction. 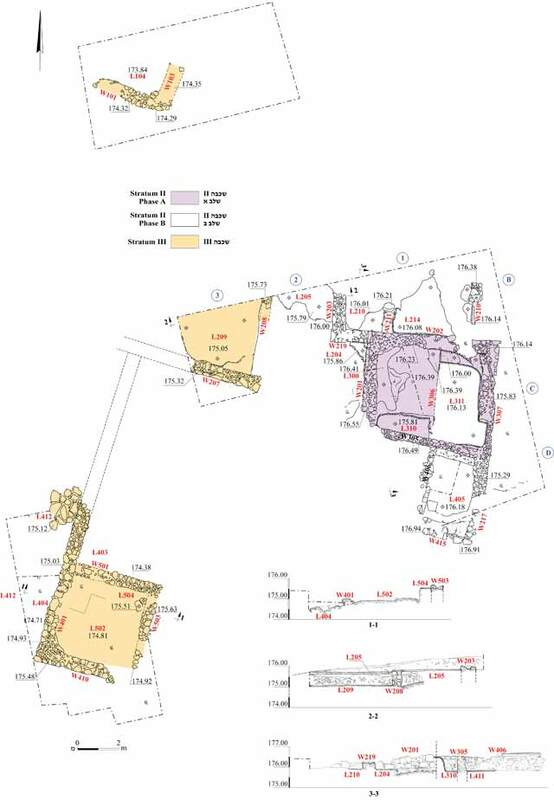 The excavation, undertaken on behalf of the Israel Antiquities Authority and financed by the Ministry of Construction and Housing, was directed by D. Masarwa, with the assistance of Y. Amrani and E. Bachar (administration), M. Kahan (surveying and drafting), A. Peretz (photography), Y. Arbel (consultation), A. Gorzalczany (scientific guidance), A. de Vincenz (ceramics), G. Adrian (pottery restoration), M. Shuiskaya (pottery drawing), R. Kool (numismatics), C. Ben-Ari (location map) and C. Amit (studio photography). 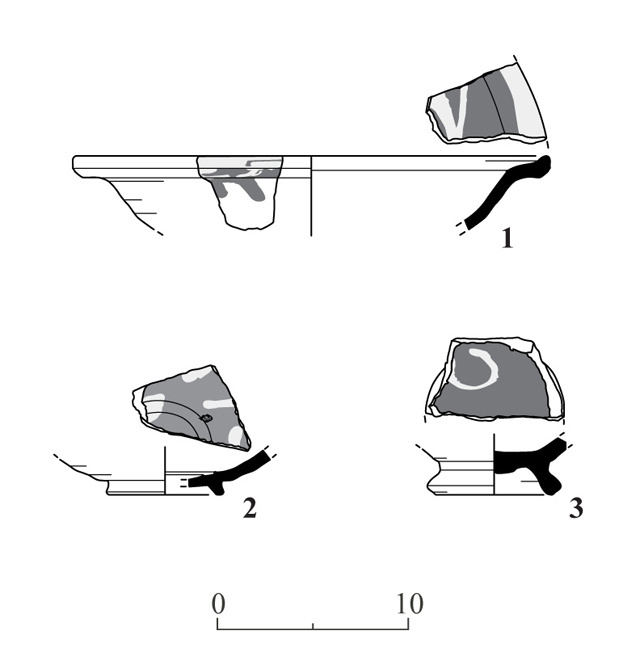 Ten excavation squares (Fig. 1) were opened along the northwest fringes of the Mazor site, which is slated for conservation prior to becoming an archaeological park. 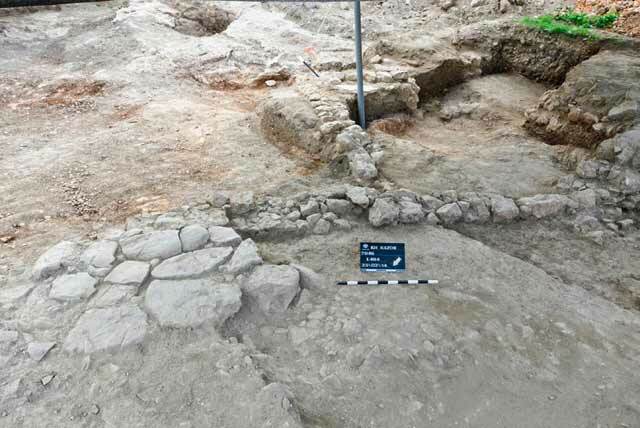 Three settlement strata were exposed: the latest (I) dating to the time of the British Mandate, a middle layer (II) ascribed to the Late Ottoman period (eighteenth-nineteenth centuries CE) and an earlier layer (III). 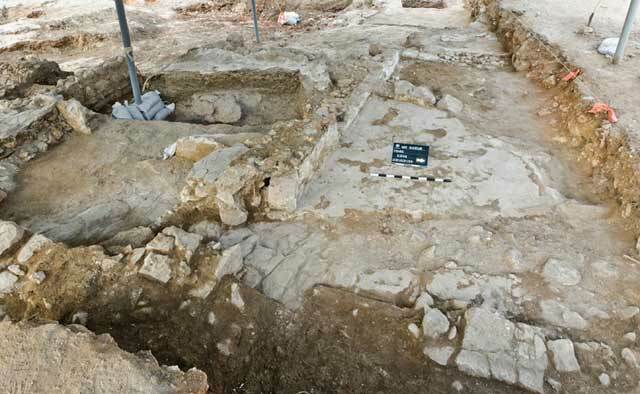 Remains of buildings, installations, a columbarium, rock-cuttings and tombs dating from the Hellenistic period to the Ottoman period have been excavated at the site and throughout the city of El‘ad (Amit 1998; Zilberbod and Amit 1998; 1999a; 1999b; 1999c; Zelinger 2001; Zilberbod and Amit 2001a; 2001b; Nagorsky 2006; ‘Ad 2008). Remains of walls and floors that belong to this stratum were found throughout the excavation area. All of the walls were founded on bedrock and were built of medium-sized roughly hewn stones with a fill of small fieldstones in between; they were preserved to a maximum height of two courses. A complete room (L504) delimited by walls (W401, W410, W501, W503) was exposed in the southern part of the area. The room’s western wall extended northward and abutted a stone-slab pavement (L412), probably a courtyard or an open area. There was apparently another room (L403) that was adjacent to Room 504, to its north. 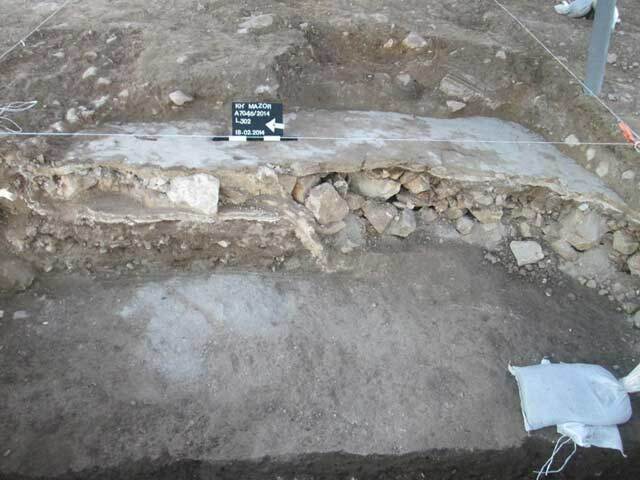 Remains of two walls (W207, W208) that bordered a gray plaster floor (L209) were exposed in the center of the area. Remains of two additional walls (W101, W103), which probably delineated a room (L104), were revealed in the northern end of the area. The architectural remains — an entire room (L504), sections of three other rooms (L104, L209, L403) and a courtyard or open area (L412) — seem to belong to one structure; its date is unclear. 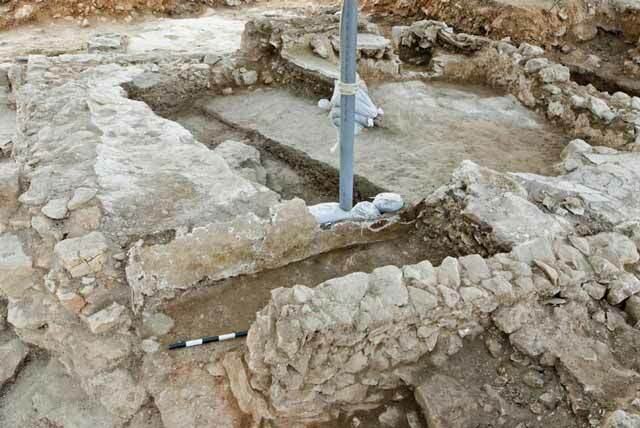 Remains of a building dating to the Ottoman period were uncovered in the eastern part of the excavation area. Two phases of use (A, B) were discerned. Phase A. Remains of a building and its wide walls (W201, W202, W305, W307; width 0.7 m; Fig. 3) were ascribed to the early phase. The walls were constructed of roughly hewn stones with small fieldstones in between. Some of the walls were founded on bedrock, whereas others were set on a foundation built of small fieldstones. The walls were preserved to a height of two to three courses. A light colored plaster floor (L300) abutted W201 and W202; two additional layers of plaster repairs were discovered above it. Floor 300 was founded on a layer of fill comprised of clay and small fieldstones. An installation (L310) was exposed in the southwestern part of the structure; the plaster layers of Floor 300 extended south and covered the northern and bottom part of the installation (Fig. 4). The numerous layers of plaster in the installation suggest that it was used in the building’s later phase as well. Phase B. The building that was erected in the early phase continued to be used, but changes were made and new rooms were added. A narrow wall (W306; width 0.2 m; Fig. 5) divided the early structure in two. The wall was constructed of small fieldstones and treated with gray plaster. A step built of small and medium-sized fieldstones bonded with gray mortar and covered with gray plaster was exposed beside to the room’s northern wall; the step might have been used as a bench. The building in this phase was enlarged to the north, south and west. Five rooms were added: three (L205, L210, L214) on the northern side, one on the southern side (L204) and one on the western side (L405). The walls of the rooms, founded on a layer of fill comprising earth and small fieldstones, were built of small and medium-sized fieldstones, some of which were roughly hewn. The faces of the old and new walls inside the building were treated with gray plaster. Traces of gray plaster floors were discovered in the five new rooms; these floors were set at a lower level than the floor of the earlier building. In this phase, two plastered entrance thresholds were incorporated in the building’s walls, one in the eastern wall (W307), the other in a new wall (W210). The ceramic artifacts from both phases of the building include locally produced vessels and imported pottery dating to the nineteenth century CE (de Vincenz, below). 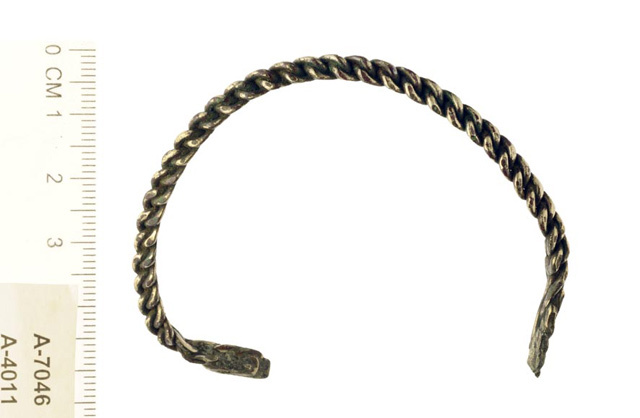 In addition, a bracelet (Fig. 6) and a coin of Antiochus IV (175–172 BCE) were discovered in the fill overlying the floors of the building. It seems that the coin is related to the settlement remains from the Hellenistic period that were discovered in previous excavations, south and southwest of the current excavation area. Remains of later floors made of a thin layer of very smooth concrete were revealed in the northeast and southwest of the excavation area. They were founded on small and medium fieldstones and in some instances on top of the remains of the Ottoman-period building (Fig. 7). Two coins, dating to 1927 and 1942, were discovered beneath one of the floors. These remains are part of the village of Muziriya, which was located there until 1948. The remains from this stratum were dismantled after they were documented. Most of the ceramic finds discussed here were found in Stratum II, and are dated to the late Ottoman period (the nineteenth century CE). The assemblage comprises mostly locally made pottery but also imported vessels. The local pottery consists primarily of black Gaza wares and coarse wares. The Gaza wares are represented by medium- and large-sized bowls (Fig. 8:1, 2), which were used as serving dishes. Other types of serving bowls made of a variety of clays (Fig. 8:3, 5) were also found. Jars are virtually absent from the assemblage, except for one jar type, made of coarse ware (Fig. 8:6). Cooking pots bearing an incised design of crisscross lines and dots that are characteristic of the local Ottoman tradition (Fig. 8:7) were found as well. Most numerous of the local, hand-made vessels were jugs and bowls that are decorated with painted geometric designs in red and black (Fig. 8: 8) — the successors of the hand-made geometric wares of the Mamluk period. 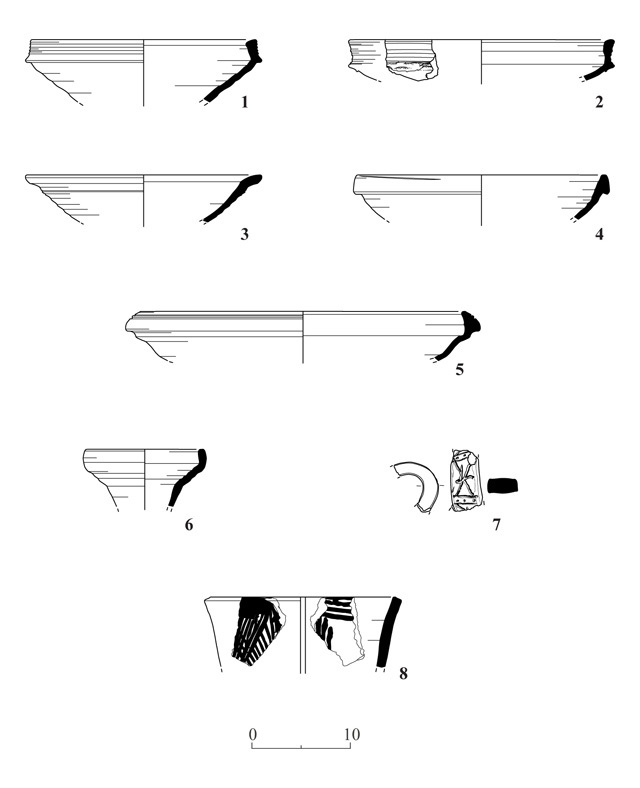 Imported Glazed Earthen Wares consisted mainly of large serving dishes or bowls imported from Didymoteicho in Greece (Fig. 9:1, 2). Their main characteristic is a yellow or green geometric decoration obtained by painting with white slip and glazing the vessel with transparent colored glaze. 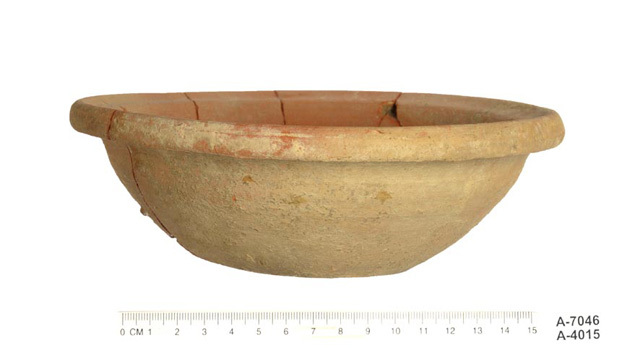 Other large kitchen bowls, imported from Greece, Turkey or southern Italy (Fig. 9:3), were found. These were decorated with painted lines comprising geometric patterns in the slip-painted fashion. 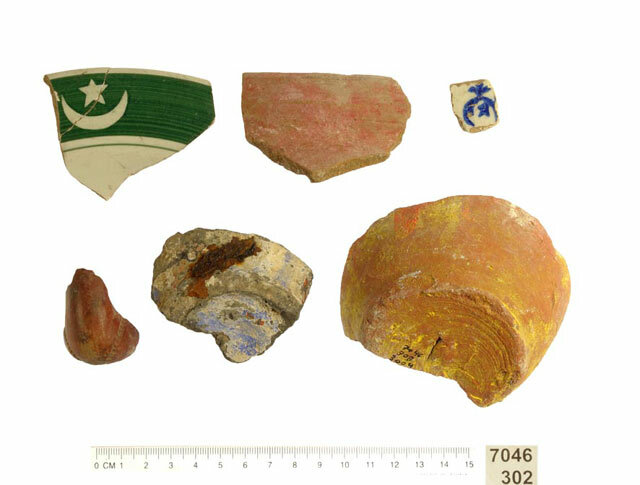 Additional local and imported Ottoman-period vessels were found in a fill above the building of Stratum II (Fig. 10): a glazed vessel which was made in Sarreguemines, France, especially for the Oriental market and was called bande etoilée; a plate stamped with a blue potters’ mark and might have been made in France or England; and locally made coarse-ware vessels, including a complete ware bowl (Fig. 11). ‘Ad U. 2008. El‘ad (Mazor). HA-ESI 120. Amit D. 1998. Mazor – 1993. ESI 18:58–61. Nagorsky A. 2006. Mazor. HA-ESI 118. Zelinger Y. 2001. Mazor (El‘ad), Area H9. HA-ESI 113:53*. Zilberbod I. and Amit D. 1998. Mazor – 1994–1995. ESI 18:61–63. Zilberbod I. and Amit D. 1999a. Mazor (El‘ad), Area M3. HA-ESI 109:57*–58*. Zilberbod I. and Amit D. 1999b. Mazor (El‘ad), Area S6. HA-ESI 109:56*. Zilberbod I. and Amit D. 1999c. Mazor (El‘ad), Sites 21 and 38. HA-ESI 109:63*–64*. Zilberbod. I. and Amit D. 2001a. Mazor (El‘ad), Area H7 (B). HA-ESI 113:48*–49*. Zilberbod. I. and Amit D. 2001b. Mazor (El‘ad), Area P4. HA-ESI 113:50*–51*. 2. Stratum III, building remains, looking southeast. 3. Stratum II, Phase A, building remains, looking west. 4. Stratum II, Phase A, building remains and a plastered installation, looking north. 5. Stratum II, Phase B, building remains, looking west. 7. Stratum I, a floor from the British Mandate period above the remains of the building from the Ottoman period, looking east.